Sad news. BBC Manchester is reporting that the gravestone of the late Joy Division frontman Ian Curtis has been stolen. 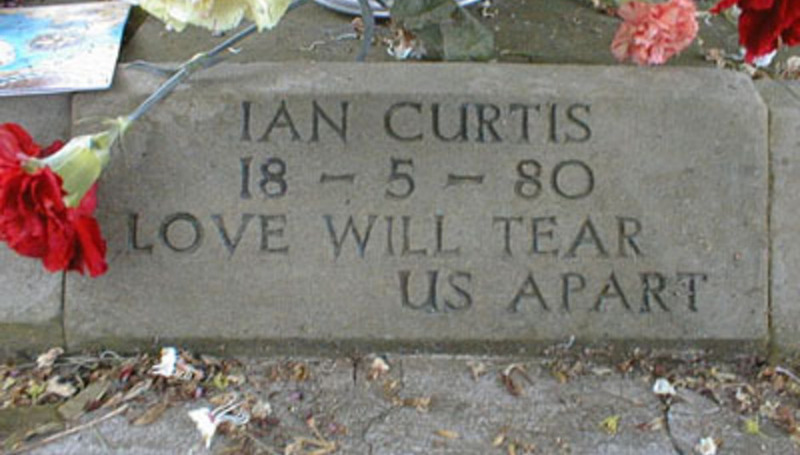 The memorial stone, which reads simply "Ian Curtis. 18-5-80. Love Will Tear Us Apart", was stolen from Macclesfield Cemetery, sometime between Tuesday afternoon and Wednesday morning. Cheshire Police are appealing for anyone with information on its whereabouts to contact them. Visit their website here. A police spokesman told the BBC: "There is no CCTV in the area and there are no apparent leads as to who is responsible for the theft. "This is a very unusual theft and I am confident that someone locally will have knowledge about who is responsible or where the memorial stone is at present." DiScuss: Who would do such an abhorrent thing?